I WOULD HAPPILY KEEP THIS! 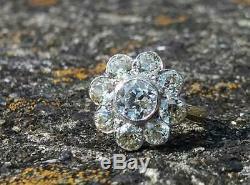 Lovely 18ct & platinum daisy cluster ring with approximately 3ct of lovely bright old cut diamonds. 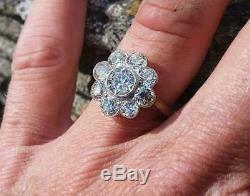 The centre stone is almost 1ct and the outer stones are 0.20-0.25ct each. All clean and incredibly lively. Not the whitest diamonds but gorgeous none the less! The head of the ring measures 15mm and is very flat to the finger, very wearable! Please see photos as they are very detailed and form part of the description. 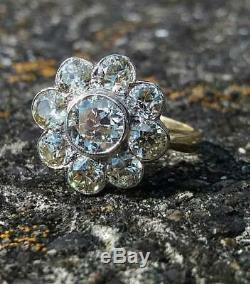 The item "ANTIQUE HUGE 3ct OLD CUT DIAMOND DAISY CLUSTER. Fine Antique Diamonds" is in sale since Tuesday, October 23, 2018. This item is in the category "Jewellery & Watches\Vintage & Antique Jewellery\Vintage Fine Jewellery\Art Deco (1915-1935)". 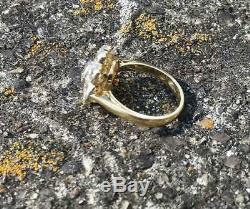 The seller is "edrury2005" and is located in Exeter. This item can be shipped worldwide.